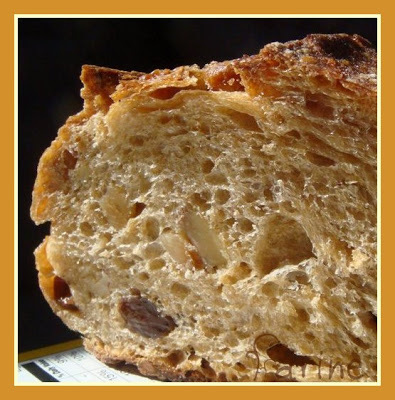 This bread is one of Keith Giusto’s favorites and a big seller in his bakery, Full Circle Baking Company in Petaluma. Made with sprouted wheat, it requires some serious advance planning since you have to soak the grain for 48 hours and wash it carefully before milling and using it. 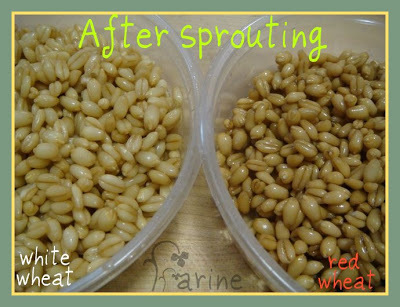 Why use sprouted wheat? Because sprouting “liberates” the sweet flavor of the kernel and, more importantly still, because it triggers the breakdown of the nutrients it contains, transforming large molecules in smaller ones more easily absorbed by the body. Two considerations come into play when selecting wheat for sprouting: first, it is essential to purchase clean wheat from a reliable source because dirty wheat may contain insects, mouse droppings, or worse and may also contain little stones which might find their way into the bread and from there into someone’s mouth and break a tooth (it could also seriously damage the milling machine); secondly, it is very important to purchase gluten-rich wheat (hard white winter wheat or dark Northern spring wheat) since, once sprouted and milled, it will replace a good proportion of the flour in the dough. When getting ready to sprout (48 hours before mixing the dough), put the kernels of wheat in a big bucket or bowl (depending on how much you are sprouting) and use 180% water for 100% wheat. Agitate the seeds vigorously to make sure every kernel is in contact with water. Repeat 3 or 4 times a day. In warm weather, change the water everyday. After 48 hours, if you press on a kernel, white matter (the endosperm) will come out. The wheat is ready. 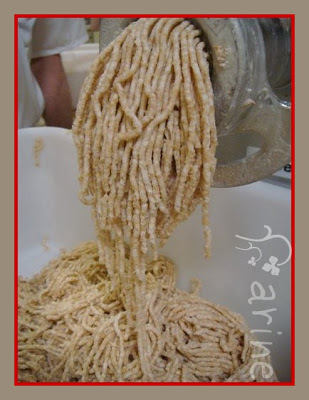 If you see even the beginning of the germ, then it is too late and the wheat cannot replace part of the flour in the dough. So watch it carefully on the second day. The next step – washing the wheat – is extremely important. 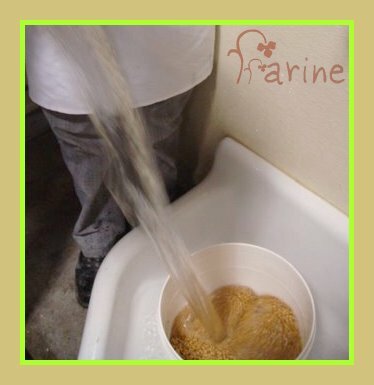 The soaking water is yellowish (or reddish) and murky and it stinks (a sign that fermentation has started). It needs to be completely rinsed out. Place the seeds in a colander (at SFBI, we used a perforated bucket) and wash. The wheat is clean when the rinsing water comes out clear and bubble-free). Once clean and drained (at this point, you can taste it and discover its deliciously nutty flavor), the wheat is milled. A meat grinder can be used if you have one. If using a food-processor, be sure to make really small batches as the sprouted wheat is quite dense and the machine might conk out. If not used immediately, the milled wheat needs to be kept in the refrigerator where it’ll stay good for a couple of days. Since the sprouting and milling process is rather cumbersome, it might be a good idea to make a big batch (for instance, four times the amount you need) and freeze the milled grain in 1-lb or 1-kg bags. When ready to use, be sure to thaw it well though as the mass becomes very stiff and would break the hook of the mixer if not completely thawed. 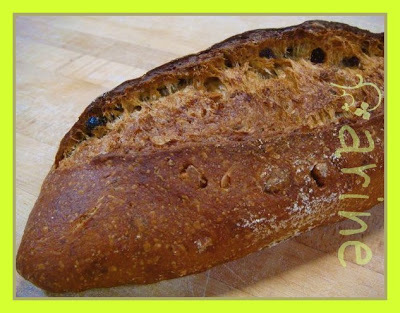 The milled grain is added to the liquid ingredients (water, levain, fruit juice if using) and the dough is mixed on 1st speed until incorporated, then the dry ingredients go in (flour, yeast, gluten if using), etc. 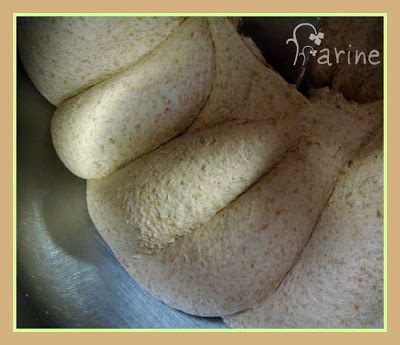 It is particularly important not to add all of the water indicated in the formula as the milled grain retains a lot of it and the dough might be too wet. I will not post the actual recipe today as I would need to recalculate the weight of all the ingredients for home use (at SFBI, we made 25 kg of power bread dough). But I will post it when I make the bread at home. 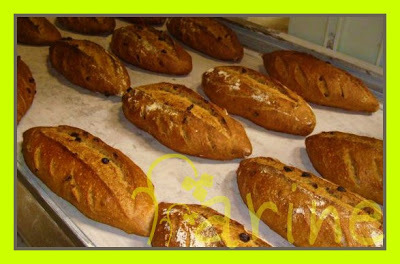 We used stiff levain, sprouted grain, bread flour, dry yeast, salt, raisins juice, raisins and toaste walnuts and almonds in the dough. The bread is delicious and keeps very well. At home I may try to reproduce it without the raisins (I love their sweetness but hate the calories they add to each slice) and halve the amount of nuts. The big question though isn’t the ingredients I’ll use. As I don’t have a meat grinder, it is really whether or not I’ll be able to mill the grain in my food-processor. There is only one way to find out… Stay tuned! That looks absolutely delicious, Susan made this on her site last year and I didn’t have any success trying, will give it another go. 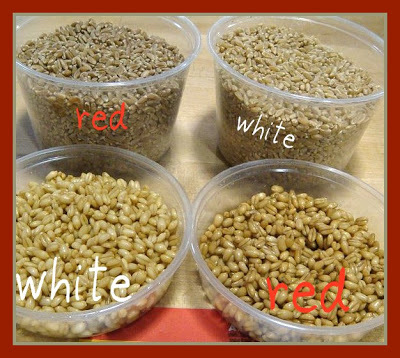 Could or is it possible to use other grain, say spelt, kamut or rye in place of wheat? It is possible to use rye but then you have to watch your water carefully (use less). 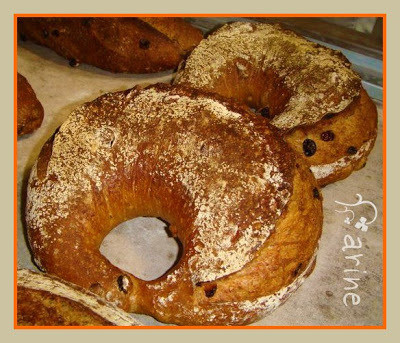 Spelt or kamut would probably be delicious in this bread but again, I would watch the water. Mmmm, I would certainly love that bread for breakfast!! Absolutely no time to try and bake it before a loooong time, but I’ll keep it in mind, thanks! I have been looking into sprouted bread formulas and this one sounds wonderful. I see that you were going to publish the formula but I haven't been able to find it. Soooo I am wondering if you can direct me to it? 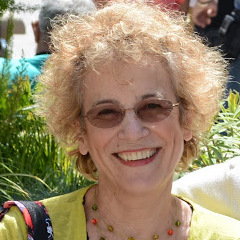 Janet, please send me an email so that I have your address and I'll send it to you. As it is, I don't know which Janet you are (I know at least three). 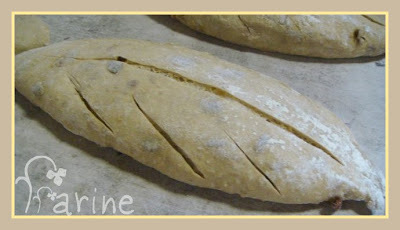 I haven't made Keith's bread yet, that's why I haven't posted it.